Apparently the groundhog didn’t see his shadow last week, because this week’s forecast is telling us that we might experience some more snow before spring arrives in March. One of the most important preparations you can make for snowy weather is ensuring your vehicle is operating safely and efficiently. Not only should you have your vehicle professionally serviced to ensure property fluid levels and brake performance, you should also be sure you have all the necessary roadside equipment in the case of an emergency. This may include spare tire, torque wrench, safety gloves, jumper cables, road flares, blankets, road triangles, extra motor oil, extra windshield wiper fluid, and anything else that standard roadside emergency kits typically offer. It is also wise to have the number to a trusted towing and recovery service on hand in the case of an emergency you are not equipped to handle. One common roadside emergency that often requires professional intervention is getting stuck in snow. And since the snow is coming back, you will do well to learn how to handle this type of situation, safely. Continue reading to do just that! Turn On Hazard Lights. First, you need to turn on your hazard lights to warn oncoming traffic that your vehicle is disabled. Ensure Everyone’s Safety. Next, you need to ensure that you and your passengers are safe. If you are on a busy road, it can be very risky and dangerous to get out of your vehicle. In this situation, you may need to jump to the last step, which is to contact a local Indianapolis towing company for professional roadside assistance. They have the resources and permits to block traffic and safely pull you out of a ditch. Get Out to Assess the Area. If your surroundings are docile, get out of the vehicle after you turn on your hazard lights. At this time, if you have a roadside emergency kit with road triangles, utilize them as well. Clear Snow From Tires. Once you are out of the vehicle, try to clear as much snow away from your tires as you can. Use your hands, ice scraper, cup, or anything else you have that can help you scoop and clear snow. 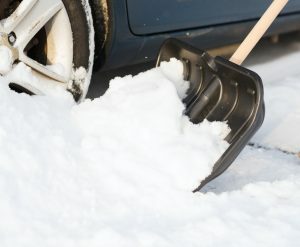 If you see high levels of snow underneath the car, try to clear that out as well. If you have dirt, gravel, sand, kitty litter, or similar aggregate around you, try laying this around your tires for added traction. Drive and Reverse Motion. After you have cleared a few feet of snow in front of and behind your tires, you can attempt the rocking method. This involves switching back from drive to reverse to slowly dislodge the snow and gain more tire traction. The problem with this step is that, if done improperly, it can damage the transmission. Be sure the car is motionless before switching gears by hitting the brake as soon as it is in the peak of each “rock.” Just do not “floor” the gas. You may need to try this step a few times before it works. If it doesn’t work after a few attempts, you still have one more option. Contact a Pro. If all of the above attempts fail, you will need to contact a local Indianapolis towing company for professional roadside assistance. It is not recommended to call a friend to tie up your vehicle and pull you out. Not only will you be risking costly damage to both vehicles, you will also be risking everyone’s safety. Furthermore, it is not recommended to have people push the vehicle. This is also very dangerous and can result in serious injuries. Call Zore’s Towing at 317-247-8484 for prompt and affordable Indianapolis towing and recovery, roadside assistance, car auctions, and more. We operate 24 hours a day, 7 days a week, and 365 days a year, so you can always count on us. As a family owned business, you can trust that our prices are fair and our customer support is sincere. Call 317-247-8484 to request a free quote or information, anytime. This entry was posted in Road Safety, Roadside Assistance and tagged 24 hour emergency roadside assistance, Indianapolis Roadside Assistance, Indianapolis Tow Truck Service, Indianapolis Towing company, stuck in ditch, stuck in snow. Bookmark the permalink.